As we prepare for our August 1-3 Institute (for which you can still register! ), I’m reflecting on the past month and feeling gratified that the benefits of our curriculum are being validated. Raychelle Castillo, Justice Wurnitsch-Hogan, Yennhi Le and Sandy Sohcot head to Washington. 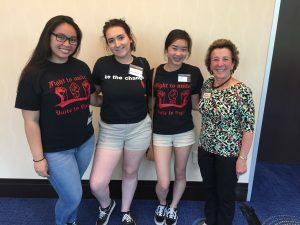 During the week of June 19-23, I accompanied three Arroyo High School students – Justice Wurnitsch-Hogan, Raychelle Castillo, and Yennhi Le — as they participated in a Human Rights Youth Summit presented by the American Friends Service Committee (AFSC). This came about because last December, while in Washington, DC to present at the National Council for Teaching Social Studies Conference, I met Jean-Louis Ikambana, Executive Director of the AFSC Human Rights Education Program. He invited me to bring students to the Summit to share their experience of using the arts to deepen learning about the Universal Declaration of Human Rights (UDHR), as well as emphasize its importance. Justice, Raychelle and Yennhi did an outstanding job of presenting their studies of the UDHR to the Youth Summit participants. Later, they eloquently explained human rights issues of concern to their community to Legislative Aides of Senators Dianne Feinstein and Kamala Harris and Congressman Eric Swalwell, whose Capitol Hill offices we visited on the fourth day of the summit. On May 31, the 11 Arroyo High School students who took part in The World As It Could Be Is Within Reach Rite of Passage put on their culminating presentation to an audience of family, friends and community members. This was my third experience of seeing young people beautifully express their ideas about human rights and a healthy community. I was especially inspired when Jorja Santillan, as the Arroyo lead teacher of the program, took the stage to introduce the presentation, first explaining how meaningful the experience was for her, as well as the students. Then, at our last Tuesday session, the students talked about what the program meant to them. I was particularly moved when one of the students said that she had started the year feeling quite sad and hopeless because of the challenging political situation. But now, because of being part of the Rite of Passage, she had not only learned a great deal, she now felt like she had a voice to express her ideas about helping her community, and was filled with hope! Getting ready for our 3-day Institute is always meaningful, but this year, it feels more personal. 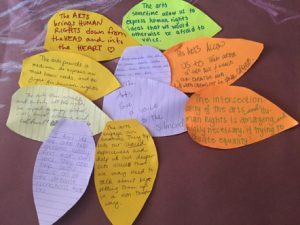 Having just seen how students look at the human side of today’s challenging issues and want to take positive action, I know that our focus on learning about the UDHR, with the arts as an integral part of the process, is having a positive impact. I look forward to connecting with the teachers and community organization leaders taking part on August 1-3 to further this process.